SENATOR JEFF SESSIONS cast himself as a strong protector of law and order at his confirmation hearing today, promising that as attorney general he would crack down on illegal immigration, gun violence and the “scourge of radical Islamic terrorism”. “These trends cannot continue. It is a fundamental civil right to be safe in your home and your community,” the Alabama Republican said while laying out conservative priorities for the Justice Department at the opening of his Senate hearing. 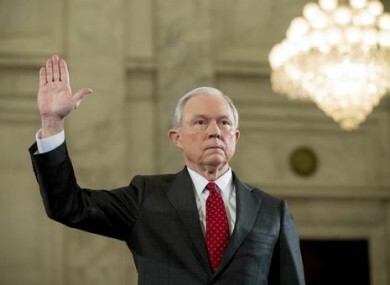 Politics got its share of attention, too, with Sessions promising to recuse himself from any investigation there might be into Democrat Hillary Clinton because of comments he’d made during the campaign. Trump previously said he would name a special prosecutor to look into Clinton’s use of a private email server, but has since backed away. The FBI and Justice Department declined to bring charges last year. Sessions has solid support from the Senate’s Republican majority, but faces a challenge persuading sceptical Democrats he’ll be fair and committed to civil rights as the country’s top law enforcement official. Senator Dianne Feinstein hinted at those concerns, saying “there is so much fear in this country”, particularly among blacks. Sessions, whose 1986 judicial nomination was derailed by allegations of racially-charged comments, sought to confront that concern by saying he “understands the history of civil rights and the horrendous impact that relentless and systemic discrimination and the denial of voting rights has had on our African-American brothers and sisters. I have witnessed it”. The office of the attorney general of the United States is not a political position, and anyone who holds it must have total fidelity to the laws and the Constitution of the United States. In a more serious vein, he was asked by committee chairman Chuck Grassley if he could stand up to Trump if he disagreed with the president-elect’s actions. Yes, he said, adding that he would be prepared to resign if asked to do something that was “plainly unlawful”. Democrats are using part of the two days of hearings to challenge Sessions’ commitment to civil rights, a chief priority of the Justice Department during the Obama administration. They are also likely to press him on his hard-line stance on immigration policy. Sessions is known as one of the most staunchly conservative members of the Senate, and has already drawn opposition from at least two Democratic colleagues, New Jersey Senator Cory Booker and Ohio Senator Sherrod Brown. In a dramatic turn, Booker — one of three black senators — said he will testify against Sessions on Wednesday, in what his office called an unprecedented instance in which a senator has testified against a colleague seeking a Cabinet post. In a statement, Booker accused Sessions of having a “concerning” record on civil rights and criminal justice reform and called his decision “a call to conscience”. Sessions was first elected to the Senate in 1996 and before that served as state attorney general and a United States attorney. He’s been a reliably conservative voice in Congress, supporting government surveillance programs, objecting to the proposed closure of the Guantanamo Bay, Cuba, detention facility and opposing a 2013 bipartisan immigration bill that included a pathway to citizenship for the estimated 11 million immigrants living in the US illegally. Civil rights advocates have rallied against his nomination, with protesters staging a sit-in last week at a Sessions office in Alabama and circulating letters opposed to his nomination. Advocacy groups have drawn attention to Sessions’ positions they suggest could weaken legal protections for immigrants, minority voters and gays, lesbians and transgender people. Sessions’ supporters have pointed to bipartisan work in the Senate and to supportive statements from some Democrats and even the son of a civil rights activist whom Sessions unsuccessfully prosecuted for voter fraud in Alabama. One of the two senators introducing him at today’s hearing was a moderate Republican, Susan Collins of Maine, suggesting a concerted effort to try to cement his appeal beyond the more conservative members. Email “Jeff Sessions says he'd be a fair Attorney General and defy Trump if necessary”. Feedback on “Jeff Sessions says he'd be a fair Attorney General and defy Trump if necessary”.